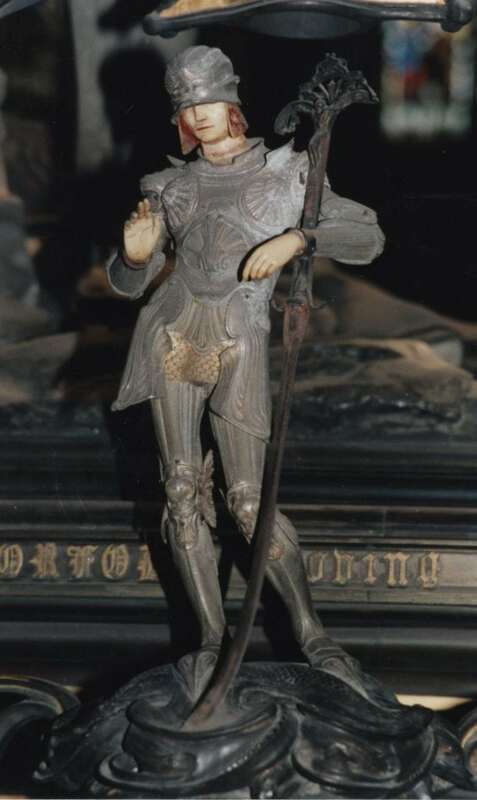 This dramatic image of St George is found on the effigy to Prince Albert Victor, Duke of Clarence and Avondale, which is located in the Albert Memorial Chapel. Prince Albert Victor was a grandson of Queen Victoria, and second in line to the throne, when he died of influenza in 1892, aged 28. Soon after his death, the Prince and Princess of Wales commissioned the sculptor Alfred Gilbert to design a memorial to their son. Alfred Gilbert is best known for the statue of Anteros which tops the Shaftesbury Memorial Fountain in Piccadilly Circus, London. However, many believe that the Duke of Clarence Memorial is his best work. The monument is located in the centre of the Albert Memorial Chapel. It sits between the memorial to Queen Victoria’s fourth son Prince Leopold, Duke of Albany, and the cenotaph of her husband Prince Albert. The sarcophagus is made from Mexican onyx and the effigy of Prince Albert Victor features a white marble head and a bronze uniform with brass facings. This is entirely surrounded by a high bronze grille on which twelve pairs of pirouetting angels support twelve figures of saints. Each of the saints was chosen by Gilbert in consultation with the Royal Family and together they reflect the life and lineage of the Prince. St George was the first of these saints to be completed. The figure is cast in aluminium, with an ivory face and hands. According to a biography of Gilbert, it took two years of steady work to complete this figure. Each of the 20 pieces of armour were cast separately and, according to Gilbert, could be worn if cast to scale. Gilbert maintained that he was influenced by Gothic art, but that the whole sculpture was his invention. The rather impractical double-handed sword, featuring a Crucifix hilt, is symbolic rather than practical. The pedestal on which St George is standing features a geometrically arranged reptile, symbolising both the dragon and All Evil. George has overcome both of these. This image of St George provides a great contrast to the medieval carving that is April’s Image of the Month. The carved St George is aggressive and strong whereas this cast of St George appears to be passive and peaceful. It is up to the viewer to decide whether this is due to different attitudes towards the saint in each era or to the differing artistic intentions of each sculptor.